Having been accused of frequent abuses of human rights in Papua, the Indonesian government took a couple of senior Australian officials on a tour of the easternmost region on Thursday to see the peaceful state of the region. Australia’s Attorney General George Brandis and Ambassador to Indonesia Paul Grigson joined Indonesia’s Coordinating Political, Legal and Security Affairs Minister Wiranto and Coordinating Maritime Affairs Minister Luhut Pandjaitan on a trip to observe the construction of the Skouw-Wutung border post on the border between Indonesia and Papua New Guinea (PNG) and other developments. The entourage left together from Nusa Dua, Bali, where they participated in a counterterrorism seminar. Wiranto said he had invited the high-ranking Australian officials to Papua to see conditions in Papua firsthand, to counter what he called misleading information about the region’s security situation. “They will personally see the condition of the region and people of Papua. A lot of information from outside does not match reality. They can also see firsthand that Indonesia is serious about paying special attention to Papua,” he added. Indonesia has been accused of neglecting development and security in the resource-rich region, leaving it mired in conflict and human rights abuses. A separatist group, the Free Papua Movement (OPM), has a degree of popular support and is occasionally involved in armed exchanges with members of the security forces. Protests demanding freedom for the region have also occurred in other parts of the country. The latest was a demonstration in Yogyakarta by students who staged a rally to show support for the United Liberation Movement for West Papua’s (ULMWP) bid for membership in the Melanesian Spearhead Group (MSG) last month. The police detained seven students and raided the Papuan students’ dormitory. There has also been a number of human rights violations recorded in the region over the decades. Human Rights Watch (HRW) recorded that among the cases is the Biak massacre in 1998 during which civilians were tortured and killed in West Papua. The Indonesian government has previously said it is examining 22 human rights violations in Papua, of which it hopes to complete three by the end of this year. Thursday’s trip also saw the officials visiting local administration offices and meeting local bureaucrats and community leaders. Brandis said it was the first time he had visited Papua. “I see pride in the people in their country Indonesia. The government is also focusing on infrastructure development in Papua, especially at the Indonesian-Papua New Guinean border,” he said. While talking to Papuan residents, Wiranto called on the people of Papua and local administrations to create a peaceful situation in the province because no development would ever bear fruit if people lived in conflict. “President [Joko “Jokowi” Widodo] really wants to build Papua in order for it to catch up with other regions. The President wishes to have heart-to-heart dialogue, listen to complaints and seek solutions, so with these good intentions it is expected that the Papuan people will build peace in Papua. How can we progress if there is no peace and live in constant conflict and disharmony with each other?” said Wiranto, who, as a former military commander, has also been accused of human rights abuses during the conflict leading to the independence of Timor Leste. Jayapura’s Cenderawasih University Students’ Executive Body chairman Goni Gobay said development, sought by the Indonesian government in Papua, would not be achieved if it failed to resolve the many cases of human rights violations. “How can we accept development while there are still wounds that have not healed? Papuans will not open their hearts to development if cases of human rights violations have not been resolved,” he said. Goni agreed that peace was important in building Papua, so the government should also invite the brothers in the forests and strive to build Papua together. Papuan religious leader Rev. Herman Saud acknowledged that the central government was open to Papua and had carried out many progressive development projects in Papua. “President Jokowi has paid very close attention to advancing Papua. This is an opportunity that should be taken advantage of by local authorities to carry out large-scale development to boost the prosperity of the people,” he said. 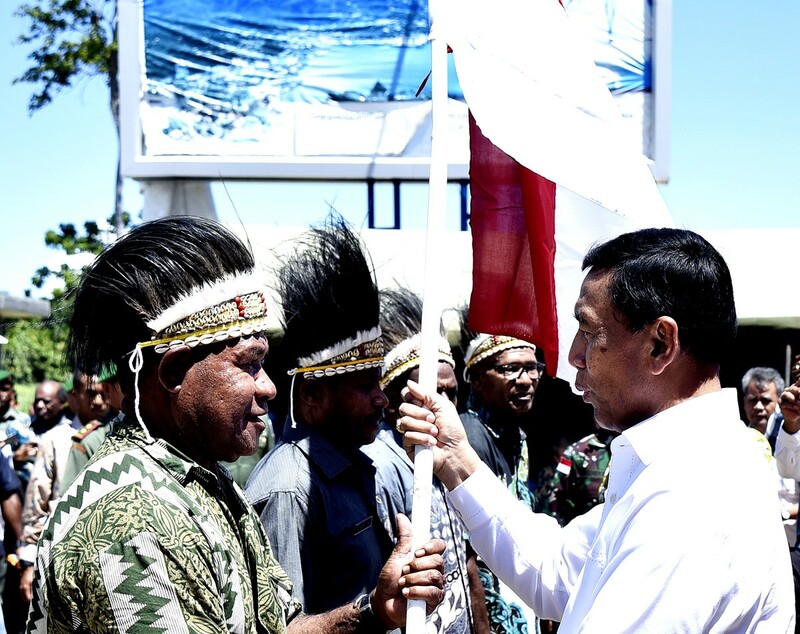 For Indonesia: Coordinating Political, Legal and Security Affairs Minister Wiranto hands over a Red-and-White flag to Kampung Mosso head Stenly Tanfa Chilong at the Indonesia-Papua New Guinea border on Thursday. People at the border area received 1,945 flags as a token of their pledged commitment to defend Indonesia.